One of the reasons why I love looking at classic religious art pieces is that you can examine them for months and still find something new. 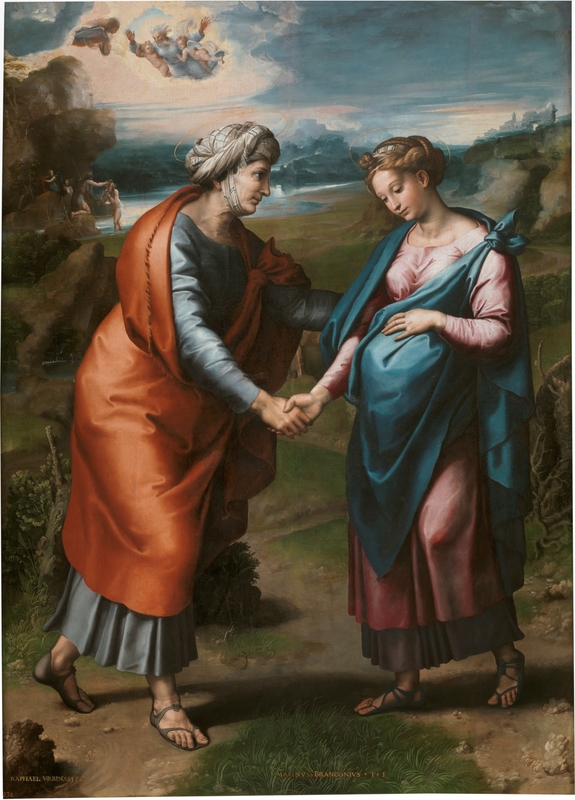 The Visitation, by Raphael and Workshop, c. 1617. Museo del Prado, Madrid, Spain. Now, I have been looking at this painting for months. It’s a stunning painting, really, and I love how Mary has such a serene look on her face, which makes her look particularly beautiful. Then there’s Elizabeth, who really does look old, which only emphasizes how much of a miracle it really is that she’s pregnant in the first place. And both of them are greeting each other with full pregnant bellies, which makes me realize how beautiful pregnancy can be… even though pregnancy can sometimes be totally rough at times… as I am once again remembering, being twenty weeks pregnant! But… I have a confession: for many months, I wondered why God was in full glory in the upper left corner. Honestly, I thought He was kind of just floating by this whole beautiful scene of the Visitation. His presence there seemed oddly random! Then, months later, I looked closer and I realized: no, God wasn’t ignoring the Visitation. He was paying attention to the Baptism. The Visitation is the first meeting between John the Baptist and Jesus that is detailed in scripture, and there are plenty of images that show Jesus and John meeting as babies in the womb, as I detailed in the blog Jesus, as Fetus. But, in this case, Raphael emphasizes the meeting of John the Baptist and Jesus by putting in the background the Baptism as a reminder of the second time in scripture that they are mentioned together! And so, this painting celebrates not only the Visitation, but the very special relationship between Jesus and Mary across the span of eternity and reminds us that Jesus and God are always present! Isn’t that cool?! Thank You for giving us the tradition of faith which is so extraordinarily rich in its layers and meanings so that we can study Your Word endlessly and still come out dazzled by Your Amazingness. Help renew our love in Your Word continuously.